Whether it is for your graduation ceremony, wedding, or that all-important presentation, sometimes you just need to look dapper in a fitted shirt and suit. It’s common knowledge that getting a suit or shirt tailored costs much cheaper overseas. But where exactly do you go? We round up tailors in Hoi An, Bangkok, Kuala Lumpur, Shanghai as well as Singapore that offer wallet-friendly tailoring. Generally, if it’s savings you’re gunning for, don’t go abroad only to tailor suits and shirts. The airfare and accommodations will make any savings null and void. But, if you are already travelling to the below countries, it’s pretty affordable to get tailored suits and shirts done. 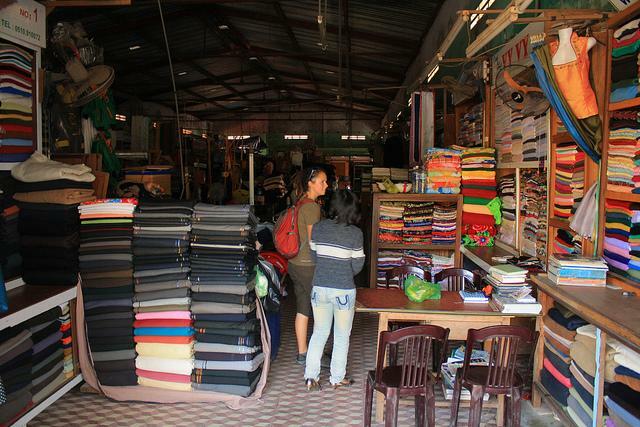 Hoi An is not only a UNESCO World Heritage Centre, it’s also the tailoring capital of Vietnam. Thanks to its past as a trading port of the Silk Route, there are 200 tailor shops in the town. The prices of tailored suits in Hoi An are a little cheaper than Bangkok. So if you have never been to this part of Vietnam, you can consider it for your next holiday. Vietnamese tailor BeBe started her first shop with family members 15 years ago. The family business now has three branches in Hoi An backed by 160 staff. The stores have more than 1,000 different types of fabrics for you to choose from. For suits, it’s mostly wool and cashmere blends. They have a fast turnaround of a day or two for suits and the quality of the suits are monitored by a 15-man team. They also offer a tour of their premises at their flagship store. Having started with just 10 family members, A Dong Silk now has 130 people on their staff. Their suits come in cashmere, linen and wool while their shirts feature different types of cotton – 100%, Vietnamese, American and Italian. They have a measurement database where they can store your particulars for a better fit and faster service. Like Bebe, A Dong Silk also has three different branches in Hoi An. Singaporeans like to go to Bangkok to shop for just about anything because it’s the Land of Bargains. Tailors are no exception. As the tailors in Bangkok are well-accustomed to receiving foreign customers (Singaporeans included), they are more well-versed in English. Some of them even have travelling tailors that will make visits to Singapore, so that you don’t have to travel to Bangkok. Narry Bespoke Tailors is open from 9am to 9pm all year round, which means that you don’t need to time your travels to suit their schedule. The family business has more than 40 years of experience and bagged Golden Shield Award given by the Thai Prime Minister. They carry fabrics from England, Australia, Italy and India. A suit can be done in less than 7 days. A 2-piece suit starts at $253 while a shirt starts at $55. They also offer a package of 2 suits, 2 shirts and 2 ties from $758, which pretty value-for-money. The Universal Tailors are reputed for their workmanship and quality of their materials. They offer shirts, pants, overcoats, smoking jackets, summer jackets, morning coats and dinner jackets. The fabric they use for the suits are high-quality worsted wool fabric (spun from combed fibres) from renowned mills like Vitale Barberis Canonico, Loro Piana, and Holland and Sherry. Their 100% cotton shirts are made from Egyptian Giza cotton and Sea Island cotton from Italy. For these materials, you will be paying a premium of $484 a suit. But that’s still way cheaper than CYC Tailor. Set aside 3 days for separate fittings for a suit and 2 days for a shirt. Crown Tailors & Suitmakers is a Bangkok-based shop near Sukhumvit. It’s popular for its excellent customer service. Fittings will take about 3 days, but do note that the tailor does not work on Sundays. Suits start from $309 and shirts cost $229 for 4 shirts. If you plan ahead, you may be able to catch Crown Tailors & Suitmakers when their tailors travel to Singapore to do fittings for their customers to save on travel costs. Malaysia the go-to place for short holidays, and it is probably the most affordable to travel to in this list. Kuala Lumpur, the capital, is only about 5 hours by coach or 1 hour by plane. The city doesn’t disappoint when it come to affordable, stylish and customised suits. Opened by a pair of brothers, this tailor shop has been operating since 1983. They have a reasonable selection of fabric and their repertoire includes 2-piece and 3-piece suits, tuxedos, uniforms as well as shirts and pants. You won’t find much official information about them when you google, but the online buzz around them are all positive. Suits start from $281, which is only slightly more expensive than getting in Bangkok. Ben Tailoring & Design is a mid-price tailor that has over two decades of experience. When you step into the store, you will get personalised service from Ben who will give advice on designs and choice of fabrics. He offers a wide selection of superfine Italian and wool fabrics from famous European mills like Loro Piana and Holland & Sherry. Ben also makes women’s suits. The only downside is that it takes two weeks to complete a suit at Ben’s, which costs $330. 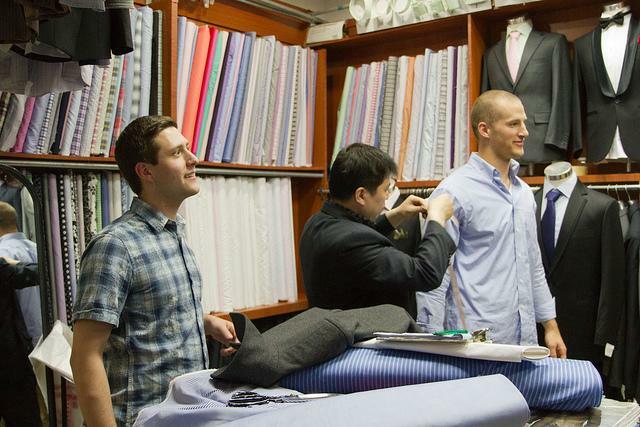 For a faster service, you can pay an extra $33 to $66 to get your suit done in 10 days. This means that you probably need to plan for an extended holiday in Kuala Lumpur if you want to collect your suits in person. Once a fashion capital in the 1920s and 1930s, Shanghai is known for cheap suits. There’s even a bustling fabric marketplace called the South Bund Fabric Market, where you can buy fabric and get cheongsams and shirts tailored for less than $150. One downside is that the market is huge and those who have been there have come away with mixed reviews. Nonetheless, it’s still worth a go if you are in Shanghai and are looking for some bespoke tailors. Indian national Tony Daryanani may look like a misfit in China, but he has run his first tailoring shop in Hong Kong for 27 years before moving to Shanghai. Tony has served celebrities, dignitaries as well as ordinary folk of Shanghai. His fabrics come from England and Italy, and his lead time of 4 days for a complete suit is relatively short. A package of 1 cashmere & wool 2-piece suit, 1 cashmere & wool jacket, 1 pair of matching pants, 2 custom-made shirts and 2 silk ties cost $795, which is a bargain compared to what you can find in high-end Singapore stores. Modern Tailor is an online tailor shop based in Shanghai. Everything from choosing the fabric and clothing item, measurements and payment can be done virtually. There are over 150 fabrics for suits and more than 2,000 shirt materials to choose from. The pricing is transparent, which means that you can take your time to think and change your mind without being hassled. You can get your shirt shipped to Singapore as well, which means you don’t even need to travel there. Standard shipping takes up to 14 days and costs $12 per shirt while express shipping takes 3-5 days and costs $20 per shirt. A customised suit in Singapore can get really expensive. At CYC Made to Measure, a suit would cost you around $910. Add a shirt to the package and the bill will total to an estimated $1,029. At The Bespoke Club, a reportedly popular tailor among the well-heeled, a package with a suit, two shirts and a tie is going for $1,599. That’s about 40% of a fresh grad’s monthly pay! SuitYourself is started by three NTU business school students who know what it’s like for students who want a fitted suit at a price that fits the wallet. To offer low prices, they work directly with manufacturers and cut out the middleman. The homegrown enterprise is good at making suits for the sweltering Singapore climate too. Their wool-blend fabric can absorb up to 30% of its weight in moisture and wick away sweat on unbearably hot days, so you can look stylish yet fresh all day. They have a shop front on the second floor of Far East Plaza. A 2-piece wool-blend suit starts from $290 while a cotton-blend shirt starts from $75. Like SuitYourself, ethan men also skips the middleman to pass on the savings to their customers. Their fabrics are bought directly from fabric mills and components like shoulder pads and zips are purchased straight from the factory. They have their own in-house tailors as well, which help them control quality and standards. Apparently, they’re the only ones in Singapore with their own production line. The local brand uses fabrics that are easy to iron and breathable for the Singapore weather. A 2-piece suit starts at $399 while a basic shirt starts at $59. Before you step into a shop, read up on the different types of suits, materials and components needed. It guards you against hard-selling tailors and also makes the fitting experience faster. If you’re going abroad, travelling during off-peak periods is always better. Not only will you beat the crowd, everything is also cheaper. For example, going to Shanghai during the off-peak season would cost $374 for a round trip air ticket. Going during peak season would cost $457 for the same flight. Fabric: Most suits are made of fabric woven from wool. Go for All Season Wool or Tropical Wool that’ll help you stay cool in Singapore’s weather. For shirts, linen and cotton are great for local weather, but linen looks a little more put together. Thread count: The higher the number, the softer and higher the quality. Patterns: Patterned fabric adds interesting details to your suits. Try pinstripe, herringbone, shark skin, tweed, houndstooth or bird’s eye patterns. 2-piece or 3-piece suit: A 2-piece suit comprises of a jacket and pair of trousers. A 3-piece, which is more formal, adds a vest to the combo. If budget allows, go with the 3-piece as you can always turn it into a 2-piece suit by ditching the vest. Single or double-breasted: Single-breasted suits are held together in front by 2 or 3 buttons. The more formal double-breasted suits have an overflap held together by 2 parallel rows of buttons. Side tabs or belt loops: Side tabs with buttons are on either sides of your pants so you can cinch your pants without a belt. Inner pockets: You can customise the size and style of inner pockets to fit small items like your phone. Noted or peaked lapels: The lapel is the flap on your jacket that goes from your collar to your navel. The traditional notched lapel is usually seen on business suits. The peaked lapel is more modern and is found on tuxedos and double-breasted suits. Another option is the shawl lapel which has no peak or notch breaking the outer line. Trouser cuff: You can choose have an optional cuff that is folded up and pressed at the end of your pants. Go for 1.5 inches if you want one. Shoulder pads: Padding gives you a more defined, broader look. They should end at the shoulder joint. Currently, it’s trendy to go without as it gives you a softer, more natural look. Arms: Make sure they’re not too baggy or tight as they’ll crease badly when you move. Sleeves: These should end at the wrist when your arms are by your side. Jacket length: With your arms at your side, your knuckle should be level with the bottom of your jacket. Pant break: A pant break refers to the slight creasing of the fabric at the end of the pants where it touches the shoes. For men of a shorter stature, “no break,” where the pants just touch the shoes, can make the legs look a bit longer. A “full break” is the longest, going up to 1 inch beyond the ankle to cover the shoes. Not everyone can turn around a splendid suit in 3 days so make sure you know your tailor’s lead time especially if you’re travelling overseas. If they require a longer time, ask if they can ship it to you for free. If you want a fast turn around and have a favourite suit, ask if they can replicate the existing suit, which can save you measuring and fitting time. Know other tailors that we should include in this list? Comment below and let us know! The post Bespoke Suits for Men - Best Tailors in Bangkok, Hoi An, Kuala Lumpur, Shanghai and Singapore appeared first on the MoneySmart blog.